The Minetti Quartett marked its fifteenth anniversary by devising and performing a cycle of concerts during the 2017-18 season at Vienna’s newest venue, the MuTh Konzertsaal in the city’s Augarten. The debut concert in Hamburg’s Elbphilharmonie, this newly recorded album, and concert tours to Spain, Italy, France, Germany, Sweden and America are further highlights of the ensemble’s anniversary season. 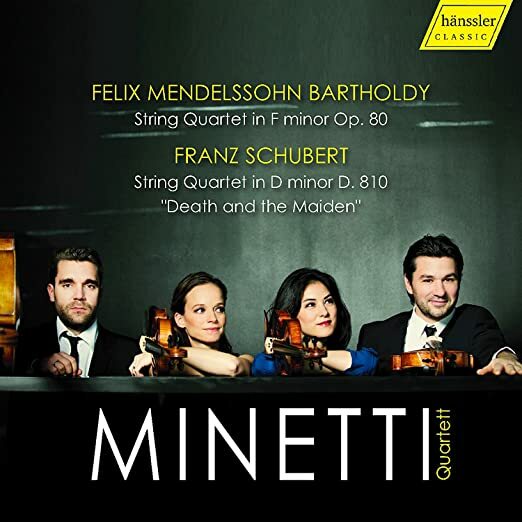 The name Minetti Quartett derives from a play by the dramatist Thomas Bernhard, who lived in Ohlsdorf in Austria’s Salzkammergut region, where the two violinists of the quartet grew up. Since being nominated for the “Rising Stars” award by the European Concert Hall Organization in 2008/09, the Minetti Quartett, comprising Austrian musicians all living in Vienna, has performed many times in renowned venues in Vienna, Berlin, Cologne, Amsterdam, Barcelona, Stockholm, Brussels, London and other locations. Invitations to chamber music festivals have taken the quartet to North, Central and South America, Australia, Japan and China. For this release, they have chosen works by Felix Mendelssohn Bartholdy and Franz Schubert, two composers that the Quartet has frequently performed.